Did You Know You Can Troubleshoot your Dryer Repair? Here's some info on how to troubleshoot your dryer repair. It's fairly simple and easy to do some of these steps before you have to call your dryer appliance repair guy to repair your clothes dryer. 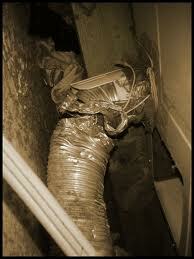 To start, problems that occur with dryers are many times caused by the dryer vent being stopped up. So first, check your vent and make sure it is still connected or not clogged. How often should I clean my dryer vent? It is very important to clean your vent out once a year. A clogged vent will be a nasty fire hazard and can reduce the life of your dryer. In addition, it's a good idea to always clean out the lint trap each time you use your clothes dryer. 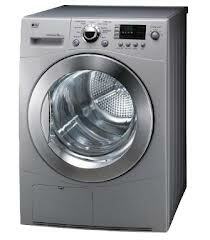 Another thing you must know before contacting you appliance repair service is the manufacturer of your clothes dryer. The procedures for clothes dryer repair vary greatly depending on the actual manufacturer. Many appliance manufacturing companies have merged, split up and gone out of business in recent years. This can cause confusion for customers, eg.,Whirlpool manufactures the Roper brand. So, you must look at the Whirlpool dryer repair section of the Manufacturer's List (see below) if you have a Roper dryer. 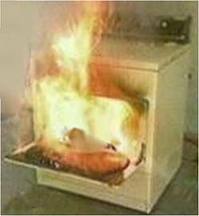 It's also very helpful to know is the exact symptoms of the problem that is occurring with your dryer. For example, if your clothes dryer is not drying your clothes thoroughly, make a note of it. If there are any other symptoms that will help your appliance repair technician, make a list of them and share that with the technician when you call to schedule your dryer repair. Why is the top of my dryer getting hot when I dry clothes? 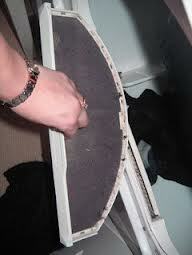 If the top of your dryer is getting hot, the vent is most likely stopped up- check the vent. I opened the door of the dryer, pressed the door switch and started it up. The heater appeared to be glowing, but only stayed on a few seconds -is this normal? This is one of the most frequently asked questions about dryer repairs. It's not a good idea to do this, because it tells you nothing. You may have tried this because the dryer is not drying clothes properly. Again, you can check the vent. If the vent is clear, give your appliance repair service company a call to schedule a repair. My dryer is only a few years old - so why is it broken down already? Unfortunately, the unhappy fact is that most major appliances manufactured today are not as well-made as they used to be. The average lifespan of most appliances today is about 6 to 8 years, whereas it used to be about 10-20 years. The cost of new appliances today in most cases is only slightly higher than it was 20 years ago, and labor, parts and materials costs are higher as well. So one way the manufacturers can continue to sell appliances at these prices is to cut the quality of the parts, so they break down earlier and folks often give up and just buy new appliances. Also newer appliances have more capabilities than they did in the past; therefore, more can break down. Here is a list of brands and manufacturers that we hope you'll find helpful. Note: Either the Manufacturer or the Currently Owned By company listed at the top may have manufactured each brand. Note that all of the information on this page is subject to change at any time and company buyout, merges and shut downs can render this information inaccurate. Copyright 2013 - Nancy S. Bechtol/ A-Appliance Repair Service - All Rights Reserved.